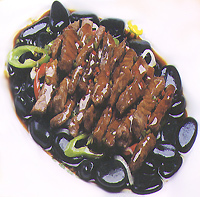 In every major restaurant of Lanzhou, capital of Gansu Province, customers can taste typical dishes of Gansu Cuisine, such as White Pagoda in Golden City, Eight-treasure Melon Carving of Golden City, Honeydew Melon with Stuffing, Lily and Peach, Hotbed Chives and Shredded Chicken, Golden Fish and Black Hairy Vegetables, and Roast Piglet. First created by Mr. Zhao Chang'an, an international special-class chef of Gansu Province, Dunhuang Banquet represents Dunhuang Culture through various kinds of courses. While enjoying delicious food, customers can also appreciate unique "Dunhuang music and dances." On the Silk Road with Hexi Corridor as the mainstay, tourists may taste various kinds of famous local dishes, such as Camel Hoof on the Silk Road, Fried Sliced Camel Hump and Fried Camel Hump and Five Kinds of Slices. In ancient times, Lanzhou was known as the "Golden City." The White Pagoda is a seven-story and eight-side pagoda on the Northern Hill of Lanzhou. After meticulous preparations, Lanzhou chefs created a cold dish called "White Pagoda of the Golden City," which vividly display this magnificent scenic attraction. This dish displays a traditional food carving art. After the pulp of a melon is taken out, the chefs carve beautiful patterns on the melon's skin, and then use the melon as a container. With exquisite patterns, this dish features a refreshing, sweet and cool taste. On the ancient Silk Road, the camel was the most important transportation means. Camel's hoofs are nutritious. 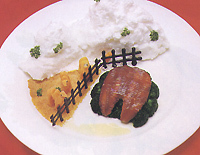 In the shape of a snow-covered mountain and a winding Silk Road, this dish is soft and tasty, with a light yellow color. Prepared with humps of Hexi camels, Fried Camel Hump is a rare delicious dish, with a history of over 1,500 years.